This workshop is open to all levels, but it is not recommended as your first AcroYoga class. For your first class, please check out AcroYoga: Basic OR an AcroYoga 101 workshop. Spotlight on (drum roll please)...... Physical Listening! Did you know you can hear with your hands, speak with your feet, and translate through touch? Yes, during class demos or (gasp!) by clicking around on the Internet, you can figure out where your arms and legs need to be to make poses work. But what about what you can’t see? 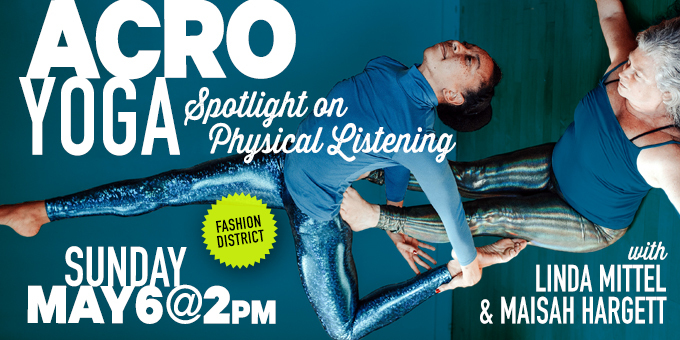 Join Maisah & Linda to feel how the skill of Physical Listening can both strengthen dedicated partnerships and also make it easier to play with a wide range of fellow AcroYogis. Learn to easefully work with people of different sizes and abilities AND find more power and presence in your playtime! After completing her 200-Hour Vinyasa Certification in 2011 (Yoga to the People, NYC), she quit her 9-to-5 in 2012 to pursue dance and yoga more fully. Being unemployed gave her more time on her hands, which she used to delve into AcroYoga & Aerial Yoga. From 2012 to 2014, Maisah completed her Kid's Yoga (Alphabet Asana), Restorative Yoga (Mary Aranas), and Aerial Yoga Teacher Trainings (OFSY). During this time she was also slowly expanding her AcroYoga practice. In December 2015 she took the plunge and completed her AcroYoga Teacher Training (AcroYoga Montréal). Linda believes in creating a playful atmosphere, cultivating grace and receptivity, while fostering a lively mix of training embodied movement technique and connection. She will warn you that AcroYoga is ADDICTIVE. She loves bringing people together in play.